With America leading incarceration rates worldwide, justice reform isn’t just a political issue, but a humanitarian one. Reform revolves around three key aspects: public safety, fiscal responsibility, and common sense solutions. 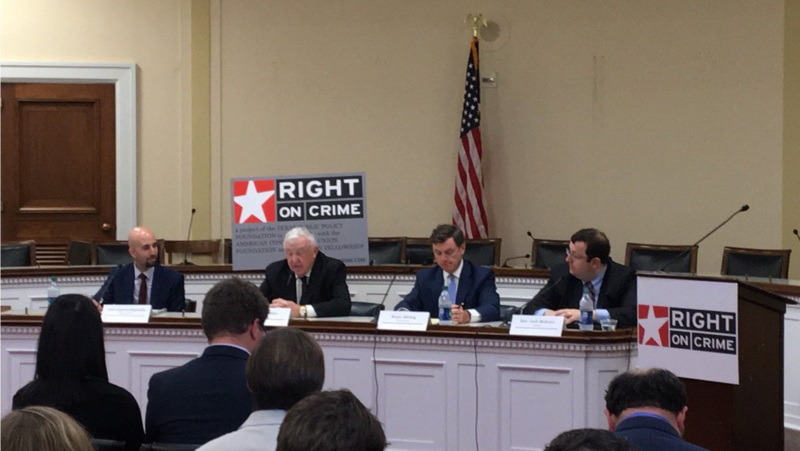 In September, Right on Crime held a Hill Briefing: How the Red States Started Criminal Justice reform. Many conservative state legislators, such as Jerry Madden of Texas and Georgia Senator Josh McKoon, have improved their states by reducing prison sentencing for nonviolent offenders. Rehabilitation programs for repeat offenders with mental health or drug addiction have also been implemented, all while cutting costs. And they are seeing results: as incarceration rates decrease, crime rates also decrease. Bryan Stirling, Director of the Department of Corrections in South Carolina, advised against locking up the people we are simply mad at. There was consensus amongst all three leaders that it is not productive to continue to lock up non-violent criminals next to violent criminals, who will in turn end up learning more serious criminal behavior. The reason for sentencing is deterrence of behavior and retribution for the victim. But with victimless crimes, prison sentencing is proving to proliferate the number of repeat offenders. Furthermore, this is why Senator Mckoon stressed that the goal after prison sentencing should be that these people will come out of prison less likely to commit a crime. With our current broken system when non-violent offenders come out of prison they are more likely than not to resort to committing a violent crime. Justice reform is a nonpartisan issue, for good reason, but conservatives are leading the way for this type of reform. Senator Mckoon suggested that conservatives are naturally behind this fiscally. With 1 in 13 people in the state of Georgia having some interaction with the federal justice system, it is clear that this area of government is too big and too invasive. A one-size-fits-all solution isn’t working, and naturally restructuring this system aligns with a conservative ideology. On the federal level action is being considered with the Sentencing Reform Act (H.R. 3713), the Recidivism Risk Reduction Act (H.R. 759), and the Criminal Code Improvement Act (H.R. 4002). Despite pending federal action, there is still a discussion to be had about reform. If you support justice reform contact your local representative today!